Well, Schulz and Peanuts is released today, and the hullabaloo has been growing. And people have been emailing me, forwarding me links to various reviews and statements and asking me for my comments and my input on whether they should buy the book. Well, I have no vast insight for you, but I do have some thoughts. But in the interest of full disclosure, I should do some full disclosure. This is probably obvious, but: when you buy books from the links in this blog or the AAUGH.com website, I make some money off of them. I have a vested interest in you buying things. Not that much — not many people actually buy from the blog links. And I do try to make sure that my reviews and views are balanced; I’ve certainly not been a “buy everything” kind of guy. I have corresponded with the biographer David Michaelis, and there have been small kindnesses in both direction. I have spent time with a number of Schulz family members, mostly with Sparky’s widow Jeannie. And while there may have been small kindnesses flowing from me, there have been far larger ones flowing in my direction. The two books of Schulz material I have put out under the About Comics label (It’s Only a Game and Schulz’s Youth) were made possible only by Jeannie’s support (and lest that be taken wrong, that’s non-financial support) for those projects, and any further Schulz projects I might put out would likely depend on that support as well. I consider Jeannie to be a positive force in this world, and not just because of how she’s treated me. As a publisher of books of Schulz material, the attention given to this book both helps and hurts me. I’ve seen a small-but-detectable immediate boost in sales from the release of the bio, but if the dark depiction of Schulz sours people on his work (and it shouldn’t, because the work is still wonderful and the bio supports that, but not all decisions are made on that logical level), that could hurt sales in the long run. Some folks are trying to cite the positive reviews of the book by folks like Bill Watterson and John Updike as disproving the claims by Schulz family members like his son Monte (and that’s a link which should be read) and his daughter Amy. That’s not logically the case. What the reviewers are saying is that the book is interesting, what the others are saying is that it’s not accurate (in details but more importantly in the general emotional portrait of the man.) Something can be both interesting and inaccurate, although I would say that something you’re reading for information becomes much less interesting if you know it to be inaccurate. Some pundits seem to be saying that Schulz wrote melancholy characters very well, and thus any statements that he was not as depressed as the book suggests can’t have any base. That leaves very little room for Schulz to be a creative or well-rounded individual. One can certainly believe one knows much about a creative person from viewing their work, but truly there is also much to be known that isn’t there. Not every complaint is persuasive; the concern that Michaelis interviewed people whose words did not end up in the book seems to miss a point that when you do that much research for a book of this nature, you’ll have to leave a lot out, and there may just have not been that much which was that interesting in the interview. However, when you have the author indicating that Schulz was a cold and distant parent (and he does), and the children who would be the main source saying that that is not how they portrayed him to the interviewer nor what they actually experienced, one has to give an awful lot of weight to that first-party experience. Having said that, I’ve only seen actual comments from two fo the five Schulz kids; in my own family, I can see that my siblings and I do not all share the same viewpoints on our parents, and it could be that the ones making the loudest noise are those who disagree the most. However, I have reason to accept that the Schulz objections are earnest, and not a manipulation. Even if one accepts that there is not consistent accuracy in the book, there is also a host of new information that has not been generally available elsewhere, and likely most of that is accurate. The question is then is it worth getting that information and hoping that you can separate the wheat from any chaff. There is also the practical ethics of deciding to buy the book. If you do suspect that Michaelis purposely manipulated the book to paint the picture of Schulz he wanted to put forth, are you rewarding bad behavior by purchasing it? Or can you really make an objective decision about that without having read the book? And will purchasing even a flawed book show a market for Schulz biography that will encourage the production of Schulz biographies that take a different angle? Or will it just encourage other negative portraits of other people, and lower the level of discourse? Those aren’t questions that I can answer for you. Some of life’s answers lie beyond even the best of blogs! I indicated in my initial review that the book was both interesting and prone to overreaching, and I think the general response has backed me up on both of those. 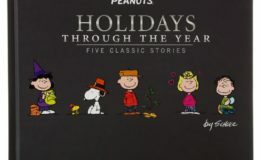 And there are interesting things to be learned from the discussion at hand whether or not you order Schulz and Peanuts. I keep promising myself I’m not going to spend more time writing about this book. I’d promise that to you now, but having broken the promise to myself repeatedly, I cannot do so honestly. But I want to say that if you want to know what Schulz was about… pull out the books of strips. And if you can, stop by the Schulz Museum in Santa Rosa and stare at the original art for a while. That’s the more important stuff for us. How rough’n’tough a hockey player he was is more important to those he was playing with.